This page contains an article from The Science Creative Quarterly on acquired antibiotic resistance in bacteria. 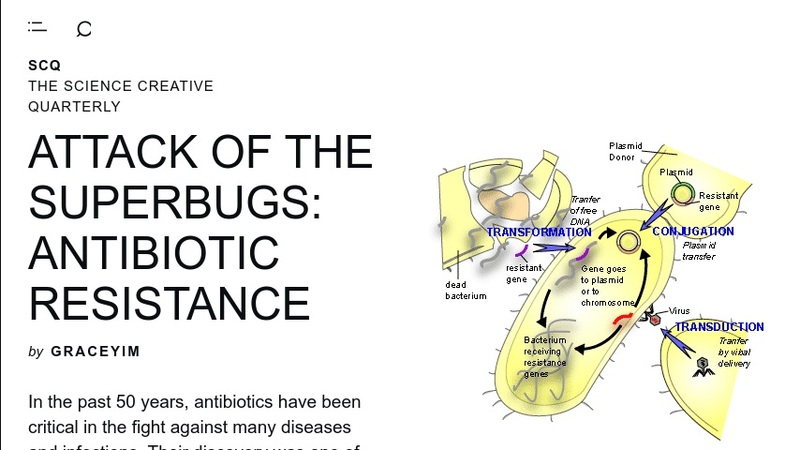 Topics covered include the discovery of antibiotics, the history and scope of antibiotic use and antibiotic resistance, mechanisms of antibiotic activity and antibiotic resistance, molecular biology of acquiring antibiotic resistance, and possible solutions to the antibiotic resistance problem. This article would be accessible to middle school or higher level students and teachers.